Okay ladies, this one is for you! I don’t know about you, but I often get caught up in the day-to-day of life. Chores, kids, meals, work…you know the drill (probably all too well!) I get drained reeealllly easily with all that I have going on, and as much as I ADORE my husband – nothing helps me forget about yoga pants and dried baby food on my shirt like a fun girls night out! I recently came across this from The Dating Divas, and I think it is SO much fun! 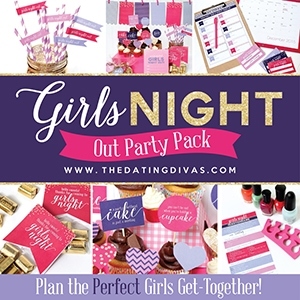 This pack has everything you need to make a fun girls night out happen EVERY month! What a great idea – too good not to share!